Yesterday the Order of the Platinum Dragon was called to the Council of Greyhawk to help figure out what to do about the sun. Panic is setting in and the world searches for a solution. Eventually, the great wizarding minds of the land come up with the idea to re-light Moradin's Forge. This is an asteroid that orbits the planet, but in the Dawn Time it was used by Moradin to create the Dwarves. He then loaned it to the gods of the Elves (who created Gnomes) and the gods of the humans (who created Halflings). He even let the gods of the Orcs use it, but they created monsters. The Forge was then put out. While this is going on the Order has been accused of opening the Temple of Elemental Evil and the murder of Aleena, something they have no memory of. We went back into their memories and uncovered their very first adventure. It was not B1 as they previously thought, but rather a visit to the Village of Hommlet where they met a cleric who wanted to know if they were adventurers like her. We got about half-way through the Moathouse and the conspiracy theories are running rampant now. The boys have pieced together every little detail they remember, including many I forgot! For example, one character, who dropped out early on, is brought up. "Where is Cynder?" refers to an elven elemental fire wizard that just stopped going with the group. We totally forgot about her, well at least I did, until yesterday. 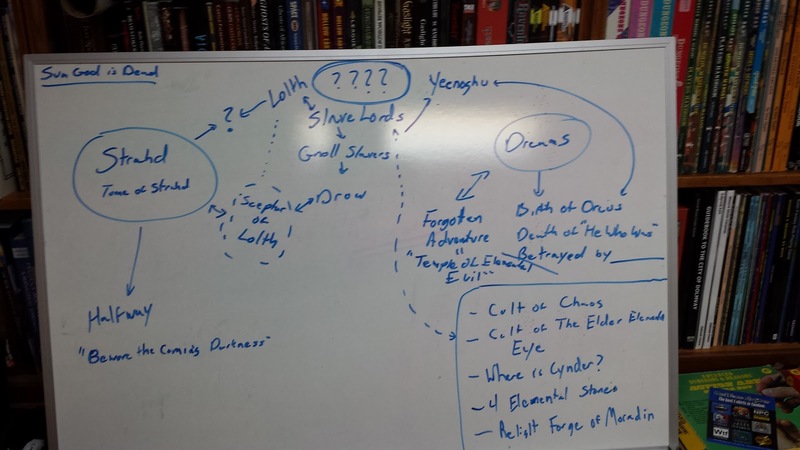 So far they have tied Lolth, Yeenoghu and Orcus together. They remember the Tome of Strahd had a partial spell to block out the sun. They remembered clues from when they went to Halfway. 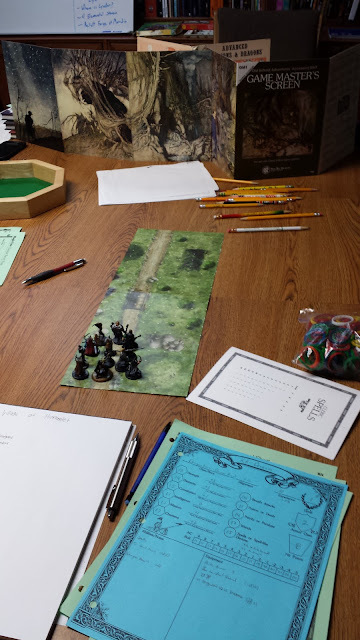 For investigating the adventureI took some cues from the novelization of the "Temple of Elemental Evil" and had a goblin raid on the town and a fire at Rufus' and Burne's tower. They never really engaged with Elmo, so I dropped him. 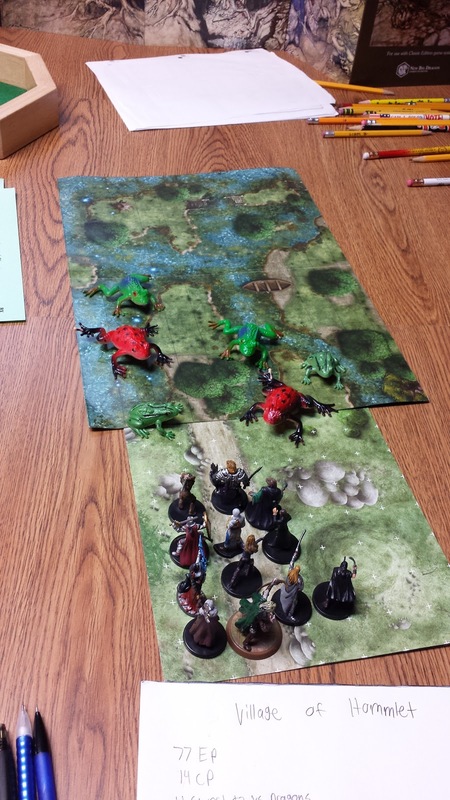 They battled the giant frogs, like everyone does. They learned quickly that Basic D&D is much more deadly than D&D3 or 5. Personally, I thought it was a blast. Tables and charts that used to be second nature to me are now less familiar, but thanks to +Richard LeBlanc's GM screen and packet it was a breeze. I will say it is one of the best GM's Screens I have used in a long time. Much more useful than the D&D5 screen and on par with the AD&D1 screen. Some things still need to happen. - Aleena has to die. Sorry, but fixed point in time. - Their memories need to be erased of this event. - Cynder needs to disappear. - The warlock, Croulie (that's how he spells it) also needs to be kidnapped by gnolls. That one is easy. - They still need to meet up Lareth and Bargel. Lareth can be killed, Bargel is going to get away. - Discover more about the "Elemental Eyes".